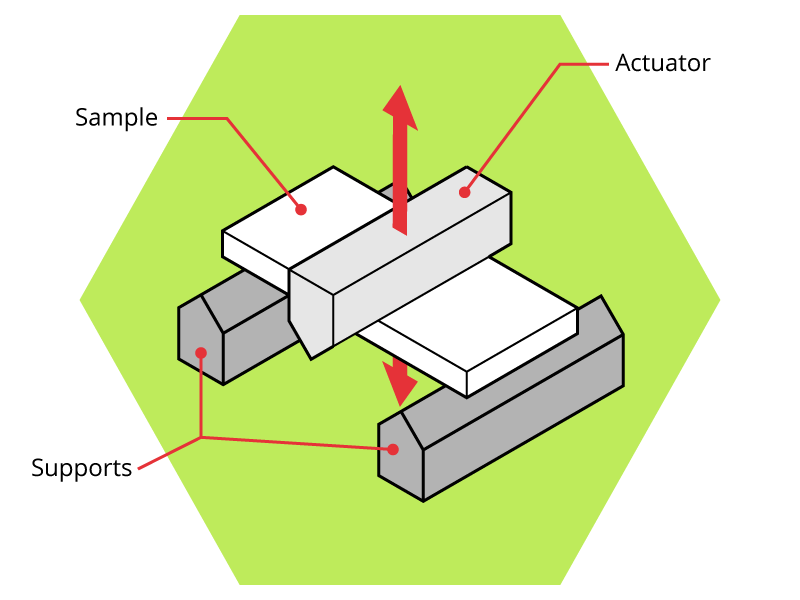 Home > Coventive Explains > What is Dynamic Mechanical Analysis (DMA)? Dynamic Mechanical Analysis or DMA for short, is an extremely versatile and flexible analytical technique for measuring the physical properties (incl: storage modulus, glass transition temperature, etc..) of a range of materials. Although initial attempts to perform this type of testing started in the early 20th century, commercial machines were not available until the 1950s and these were extremely limited in what they could do. It was not until the 1980s, when the processing power of computers were combined with the mechanics of the DMA, that the technique acquired wider appeal among scientists. During this time many commercial instrument suppliers began to sell DMA machines and gave the technique various different names, some of which are still in use today such as as dynamic mechanical thermal analysis (DMTA), dynamic mechanical spectroscopy or dynamic thermomechanical analysis. Example of commercial DMA instrument. Image courtesy of Mettler Toledo. As the technique developed more and more features were added such as the ability to test samples in different forms (solids, liquids, pastes, etc..), in different mode (tension, shear, bending, torsion, etc) and in different environments (air, liquid, range of humidities, etc.). More powerful machines allowed larger, more representative samples, to be tested. This is particularly important for composites, where different layups can influence the results. As the power of computers increased the DMA technique became more user-friendly, which led to the instruments being used in quality control environments, as well as in the development of new materials. 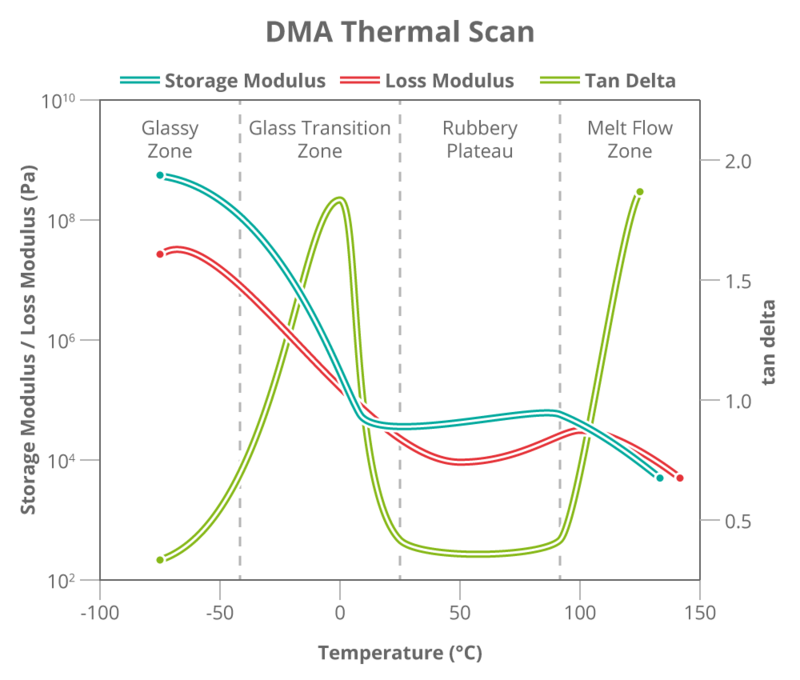 DMA is now firmly established within the thermal analysis family of techniques, including Differential Scanning Calorimetry (DSC), ThermoGravimetric Analysis (TGA) and ThermoMechanical Analysis (TMA). Although DMA can be used to investigate many physical properties of a material, its key strength is the evaluation of the glass transition temperature (Tg) of a polymer. The DMA’s sensitivity for Tg makes it the preferred tool for scientists around the world. Not only can DMA accurately measure Tg it can also successful identify secondary transitions, which have a significant impact on the performance of a polymeric material. 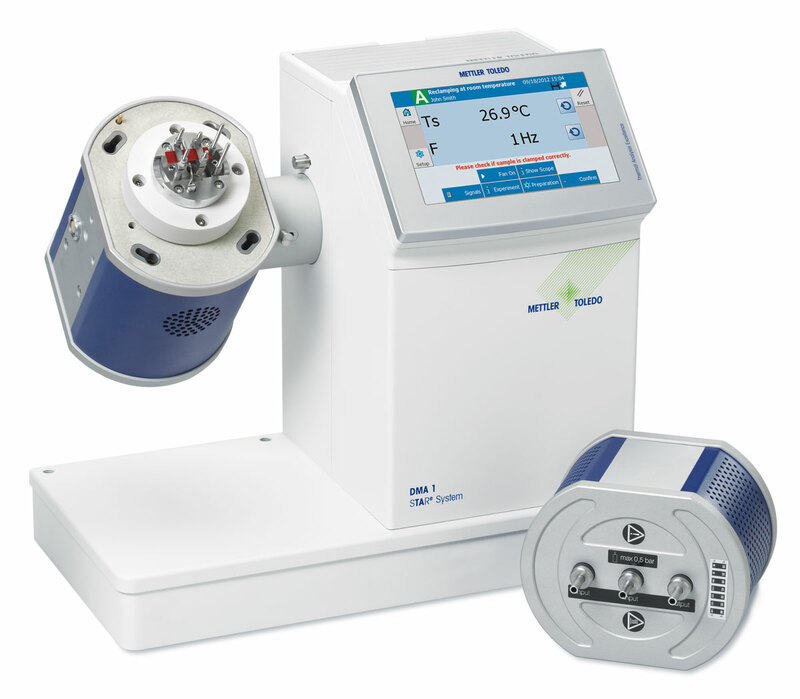 In standard use the basic operation of the DMA involves the application of a sinusoidally varying stress to a sample and the monitoring of the resulting deformation. In typical DMA experiments the stress is applied at a constant frequency (usually 1 Hz), the strain is kept constant and the temperature is increased at a constant heating rate (typically between 1 & 5°C/min). As previously mentioned various modes are available to hold a sample, which allows a full range of material types to be measured. 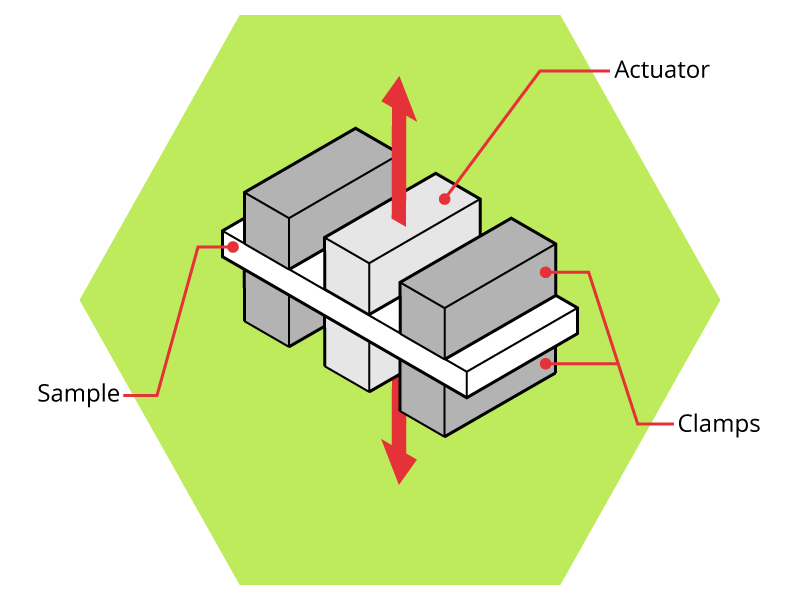 The output from a DMA unit is in the form of key mechanical properties (storage modulus E’, loss modulus E” and a measure of “damping” or loss tangent) versus temperature or time. On some DMA machines the coefficient of thermal expansion (CTE) can be measured, as the expansion or contraction of a sample is measured. Although DMA is a very versatile technique, it has its drawbacks. 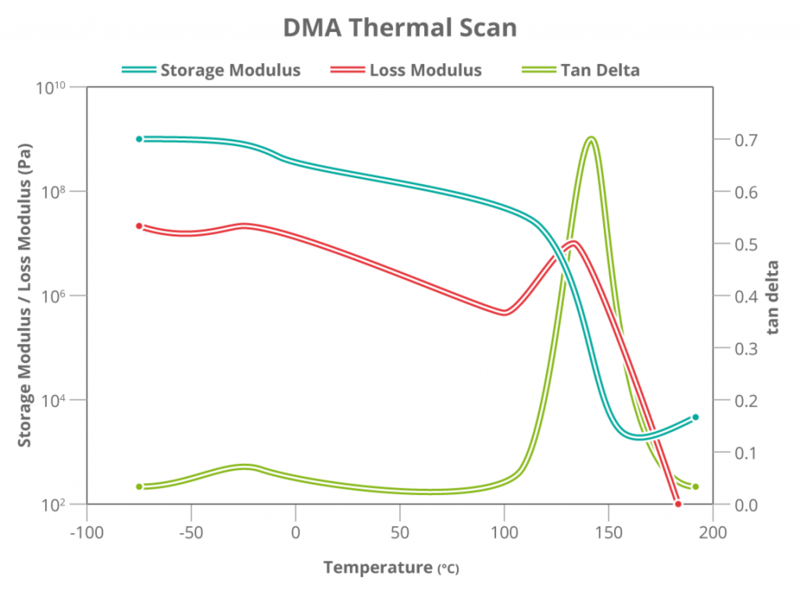 For example DMA can measure the storage modulus (E’) of a polymeric material, but to achieve an accurate value is very challenging, especially if the operator is performing a thermal scan of the material. In order to allow for the significant changes, which occur in mechanical properties (when a polymeric material is heated) the sample size used for such a test is a compromise in order to keep it within the measuring range of the equipment. 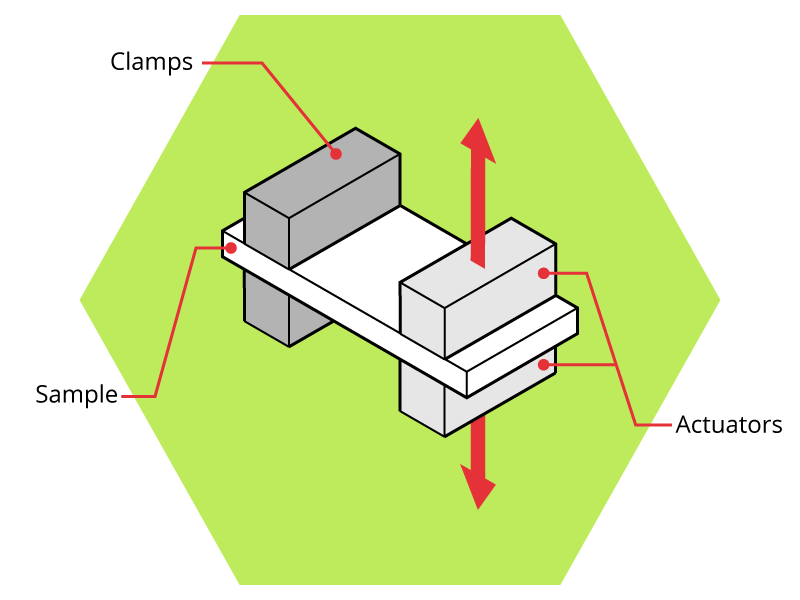 To obtain accurate storage modulus (E’) data of a polymeric material, the test is best performed isothermally and significant care must be taken to ensure that the most suitable sample size and clamping geometry is used. 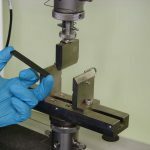 Although it can sometimes be challenging to obtain accurate mechanical data using a DMA, the main purpose of the technique has always been to compare a series of tests using the same sample size and test conditions. Aspects of a material’s formulation or processing conditions can then be varied and the impact on the physical performance of a material studied. This is perfectly acceptable OK if you use the same instrument is used from the same manufacturer, but comparison between different machines do not show a particularly good alignment of the results. This is not surprising as the chambers, which hold the samples from different manufacturers are of significantly different design and sizes. This leads to varying thermal profiles within the chambers and this can lead to subtle, but important variations in the results. Clearly this has to be taken into account when performing DMA experiments and steps have been taken in recent years to attempt to standardise some of the test procedures in order to address this type of issue. The measurement of food products, such as the direct measurement of the melting of chocolate or the frying of potato chips at different temperatures and in different environments (such as cooking oil). Optimising food products to meet customer expectations is an ongoing challenge and the DMA’s unique ability to provide useful mechanical data in challenging environments is particularly useful. Coventive Composites has significant experience in the use of the DMA technique, which we employ in both the development our our own materials, as well as providing a service to external customers. All modes of operation are available, as well as some of the more unusual set-ups of the equipment. Please feel free to contact us to discuss your testing requirements or visit our website for further details. Gary is a Senior Project Manager at Coventive Composites.